Bench/pillar drills including an articulated arm machine with a maximum throat of 2ft./60cm.- capable of drilling a 23mm hole in the middle of something 4ft./120cm wide.Larger holes can be bored out. Auto-reversing tapping attatchments for the above. Special purpose air operated drilling machines. Grinders mostly used for our own toolmaking & sharpening requirements. Various vertical & horizontal linishers and band grinders for de-burring and surface finishing - often used for pre-polishing operations. 24” Flat Lapping Machine - parts to be lapped must fit inside 9.75”(247mm) dia. rings. Parts made using the above processes can also be welded together and/or polished if required and we can also handle plating or anodising. 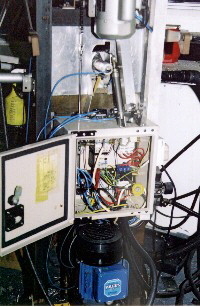 Rear view (showing control box,motors,etc. )of purpose made electrically powered,pneumatically operated,automatic drilling,de-burring,reaming and spot-facing machine designed and built in-house.